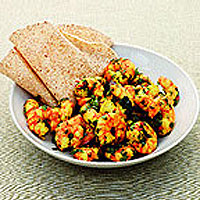 This tasty dish is quick to make, and goes very well with salad and chapatis. Begin by defrosting 2 x 200g packs raw, peeled king prawns. Bring a large pan of water to the boil, add salt and 2 tsp turmeric. Add the prawns and cook for 2-3 minutes, till the prawns are opaque. Drain and, while hot, toss in enough sunflower or olive oil to lubricate but not drown the prawns. Deseed and thinly slice 1 red and 1 green chilli, and add to the prawns with plenty of chopped coriander. Season, and add a good spritz of lemon or lime juice.